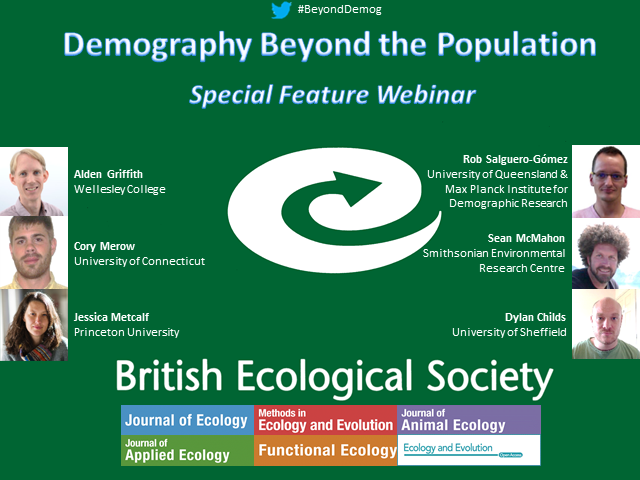 This webinar will highlight some of the contributions recently published in the British Ecological Society journals Special Feature entitled "Demography Beyond the Population". This Special Feature was a collaborative effort including articles in all six BES journals. This is the first time such a large ecological collaboration has been attempted worldwide. This cross-journal approach has allowed us to highlight the strongly interdisciplinary nature of the field of demography to its fullest potential as well as to lay down the foundations for future directions at the interface of ecology, evolution, conservation biology and human welfare. The webinar has several international speakers and will discuss the articles in the Special Feature and the implications for demography research going forward. Roberto Salguero-Gomez, Alden Griffith, Johan Ehrlén, Daniel Falster, Maria Uriarte, Marianne Mugabo, Elizabeth Crone. Presented by: Roberto Salguero-Gomez, Alden Griffith, Johan Ehrlén, Daniel Falster, Maria Uriarte, Marianne Mugabo, Elizabeth Crone.